Fish are a highly diverse group of vertebrates with over 32,000 known species that are a result of over 500 million years of evolution. For a small state, New Jersey has a rich diversity of fish species, being home to 93 freshwater species and more than 330 marine species. Along with this species richness there is an incredible diversity of microbes, including parasites, viruses, and bacteria, that infect them. Diseases in fish are often a result of compromised environmental conditions. The fish pathology unit is a component of the Office of Fish and Wildlife Health and Forensics dedicated to understanding and responding to disease problems in New Jersey's fisheries. Through disease surveillance and research we study and respond to fish diseases throughout the state. Ongoing research is directed towards understanding the health of wild fish in marine and freshwater environments throughout the state, as well as the health of the freshwater fish raised in the state fish hatcheries. Please use the links on the left to navigate the fish health page to learn more about our projects. 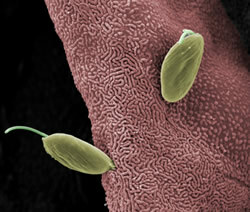 Scanning electron micrograph showing the flagellated protozoan parasite, Ichthyobodo necator, attached to the surface of a fish gill.